In 1707 the two kingdoms of Scotland and England had been united, a highly unpopular move across much of Scottish society. The Jacobites sought to exploit this not simply to reverse the union, but to gain the crown of both England and Scotland. An abortive rising took place in 1708. Then, in 1714, when the Elector of Hanover succeeded Queen Anne to the throne he alienated a range of former supporters of Anne. One of these, the Earl of Mar, threw in his lot with the Jacobites and in September began to raise forces to march south to join with English Jacobites, in an attempt to return a Stuart to the throne. To counter the uprising the government dispatched a combination of Scottish and English regiments under the command of the Duke of Argyle. During October there were various manoeuvres, including against Edinburgh. Then on the 10th November the Jacobite army marched south from Perth, reaching Kinbuick, just north east of Dunblane on the 12th. 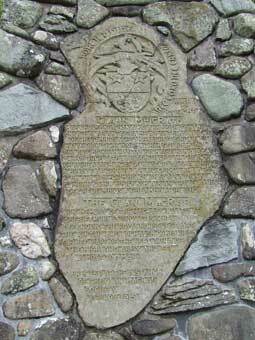 Argyll had marched north and was already at Dunblane, intending to intercept the Jacobite force. The government army may have been outnumbered by about 2:1, but it was made up of regulars fighting under an experienced commander. The Jacobites drew up in battle formation on Kinbuick Muir, presumably in order to control the road north from Dunblane, but had to move more than two kilometres south east from here on to Sheriff Muir, to the east of Dunblane, to engage the government force. The manoeuvre proved difficult for the inexperienced Jacobite troops, disrupting their intended battle formation and putting them at a disadvantage in the coming action. Argyll’s forces ascended the hill from the direction of Dunblane, but the Jacobites were on the field first and could choose their ground. The Jacobite forces deployed with boggy ground on their left flank; though Reid suggests this was unintentional and caused further disruption to the Jacobite deployment. However, it may be that they intentionally exploited this ground, unsuitable for cavalry action, to anchor their flank and enable the massing of their inexperienced cavalry on the right flank, giving them at least some advantage in numbers against their far more experienced adversaries. Both armies outflanked each other on their right wings, frequently intentionally the stronger of the two cavalry wings in historic battles. The Jacobite attacks were somewhat disordered, but on the right they were successful and drove off the Hanoverian left who had still not fully deployed and seem to have been caught in the flank by the Highlanders’ charge. These Jacobite forces of the right then continued in pursuit of the routed forces, thus losing the opportunity to attack the exposed flank of the remaining forces of the government centre. On the Jacobite left the Lowland forces also attacked but were met by well deployed government troops, who held the Jacobite attack. The frozen marsh seems to have enabled government foot though not cavalry to manoeuvre on the Jacobite left flank. The Jacobites were driven back in a fighting retreat as far as the River Allen east of Kinbuck, during which many were probably killed, particularly at the crossing of the Allen. 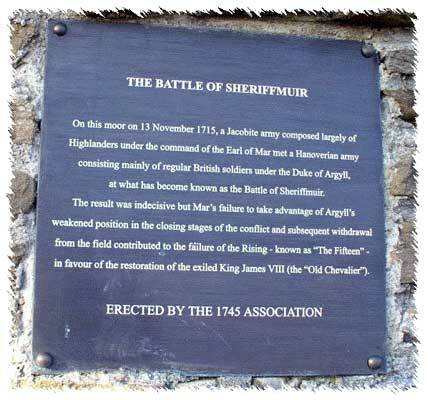 Sheriffmuir was the key battle of the 1715 Jacobite rebellion. Though Mar might claim that he held the field, in reality it was a defeat and caused his forces to retreat back to Perth. Even the arrival of James Stuart in late December failed to enable a recovery of the momentum of the uprising. 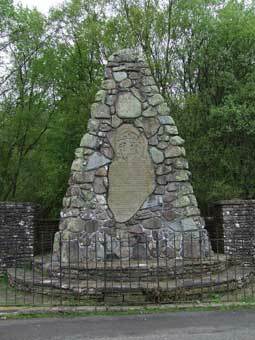 An obelisk monument to the Clan Macrae, erected 1915, stands on the battlefield. 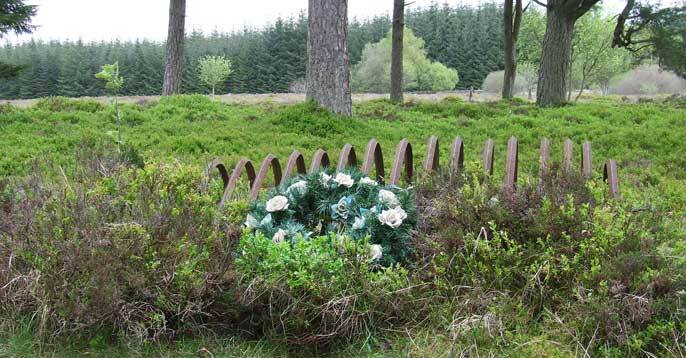 The Gathering Stone is a block of grit, since 1840 enclosed in an iron cage, where the standard of the Scottish clans is said to have been placed. It is in reality a much earlier standing stone but one which has gained traditional association with the battle.